Kikugawa Eizan (1787-1867) A Boy Disguised as Ebisu from Kodomo asobi Shichifukujin (Children at Play as the Seven Gods of Fortune) 1807. Oban. An important work by Eizan from very early in his career. 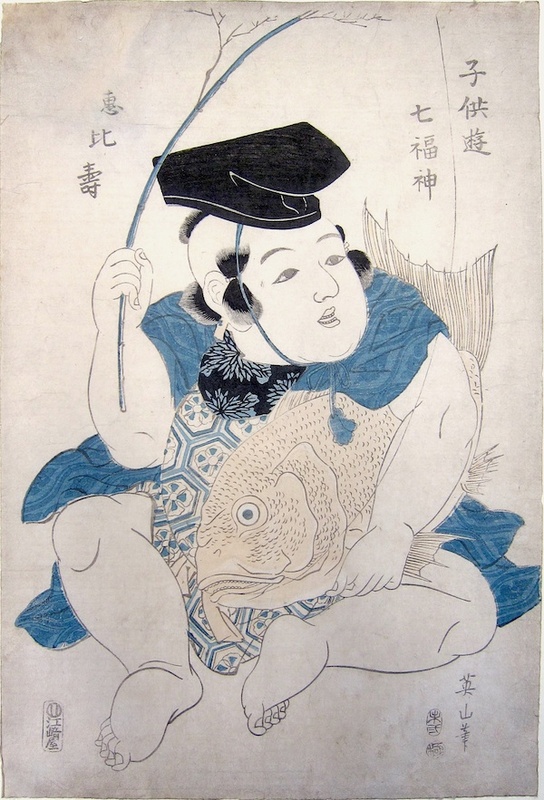 This exceptional print depicts a small child holding a rod, a line and a large Sea Bream. It is a mitate; the boy is disguised as one of the seven Gods of fortune - in this case Ebisu. It is a sensitive and rare work still rooted in the traditional, restrained, classical style of ukiyo-e that he learnt from Utamaro, (although he was not formally trained by him) and carried out the year after Utamaro’s death. Ebisu is the only one of the seven Gods of Fortune to be born in Japan. Legend has it that he was born without a skeleton (hence his early name Hiruku or Leech Child). He was thrown into a river and rescued and raised by the Ainu tribe. He subsequently grew bones and became gifted as the the God of fisherman, luck and the guardian of small children. Here he is pictured with the accoutrements of the fisherman, a large Sea Bream under his arm. This is a lovely piece, archaic in feel, design and colouration. An important piece, being so early in Eizan’s career and unusual in its subject matter. Full size, the impression is fine, the colour a little faded - as is usually the case with early prints like this. The condition is good with the exception of some scuffing to the edges. Eizan is hugely collectible and seen as the last of the line of artists in the tradition of Utamaro. Signed Eizan hitsu, published by Ezakiya Tatsuzo.